Just wanted to point out something I thought about this morning on the way to work, after remembering that tonight is the Winter Olympics opening ceremonies: a friend and I watched part of the 2008 Summer Olympics opening ceremonies from a Schlotzsky’s Deli in Berlin, just around the corner from the Checkpoint Charlie museum. So weird for two native Texans to watch a television event taking place in China from a chain restaurant in Berlin that was originally founded in Texas. *Note: we did not choose to go into a Schlotszky’s in Europe on purpose. 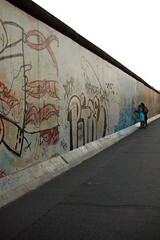 I’m thinking a lot about Berlin again for the first time since coming home from my visit last year. Did I not tell you what happened last year? Oh. When I got back from spending ten days in Europe with a friend, the first thing I did was get sick. Berlin was the last stop on our trip, so since I was still thinking about it while recovering on my couch, I ended up reading lots of Wikipedia articles about Germany. 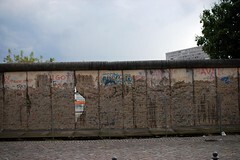 Among other things, I read about the Reichstag fire, the rise of Nazism, Leni Riefenstahl, Hitler, Eichmann, Anne Frank, the building of the Berlin Wall, life in East Berlin, reunification, and everything I could about WWII-related monuments in Germany. By the way, when someone calls or emails to ask how you’re doing, don’t say, “I’ve got a cold, so I’m laying on my couch reading about Hitler.” People will worry about you. Of course, the fact that I’d just seen in person many of the locations I was reading about added some interest as well. Since I’ve gotten to the point where Wikipedia articles and their associated links aren’t enough information for me, I’ve asked Metafilter (asked Ask Metafilter? Anyhow) to help me find a good place to start. Since I can count on two hands the number of real nonfiction books I’ve read,** I’m hoping for something thorough but not too dry, in-depth but not too insurmountable. But here’s the thing. Nothing I read is going to compare to standing there in the exact spot where important events took place. I know that’s an obvious point to make, but look: Oscar Wilde’s arrest is more interesting because I’ve seen the hotel where it happened. The Michael Jackson baby-dangling incident is more interesting because I’ve seen the hotel where THAT happened. I don’t know about all the interesting things that happened in Ecuador, but hey, I might have seen where they happened. I laughed in his face. ARE YOU KIDDING ME, DAD? I said. My dad, who would bring us currency samples*** and gifts and stories every time he left the country on business; my dad and mom, who for awhile took us to a new US state every other summer; my dad and mom, who counted among their friends a couple who went abroad every single year–to Russia, Australia, Peru, Europe, you name it–and brought us gifts and slideshows and stories every time; has no idea what makes his daughters want to travel. He and my mom also, after taking us to Astros games on Sundays and watching them on TV with me every evening in the summers, wonder why I like baseball. Hey, I can’t help that I got parented properly. I went to three places I’ve never been in Europe last year, so next year I think I’m going to go somewhere else I’ve never been. It’d be nice to leave the country every single year, but I’m not a gazillionaire nor do I have any sponsors, so every other year will have to do. Which is too bad, because I’m rarely as happy as when I’m traveling. So, who wants to ride the entire length of the Trans-Siberian Railway with me??!?!?!? *Mostly. I went through a period a few months later where I was reading lots about Ted Kaczynski and McVeigh and Jeffrey Dahmer and such. What? **Most notably Our Guys by Bernard Lefkowitz and William Faulkner: The Man and the Artist by Stephen B. Oates. And by real non-fiction I mean non-Sedaris, because he doesn’t count. ***I still have a little zipper bag full of 80’s money from all sorts of countries.